An early twentieth-century Lebanese-American writer, Khalil Gibran instilled his poetry and art with his experiences in both the East and West. This selection of quotes, maxims, and aphorisms is drawn from such poems as “Secrets of the Heart,” “Spirits Rebellious,” and “Broken Wings,” as well as from his autobiography and essays. 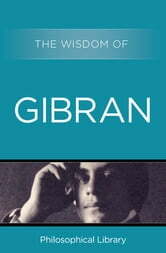 Gibran’s words express a strong spirituality and mysticism and his voice offers a direct and at times optimistic view of the brotherhood of man. Addressing everything from love and death to Jesus, motherhood, and nature, Gibran’s wisdom remains thought provoking and inspirational.